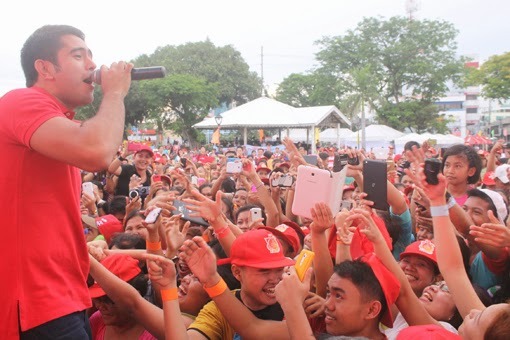 Gerald Anderson, Julie Ann San Jose and Sponge Cola thrilled Families and friends at the Plaza Independencia during Jollibee Family Bee Day Grand picnic in Cebu. Families converged in 5 different venues across the country happening simultaneously at the Quirino Grandstand in Metro Manila, Bayanihan Park in Pampanga, Nuvali football grounds in Laguna, and Crocodile Park in Davao. 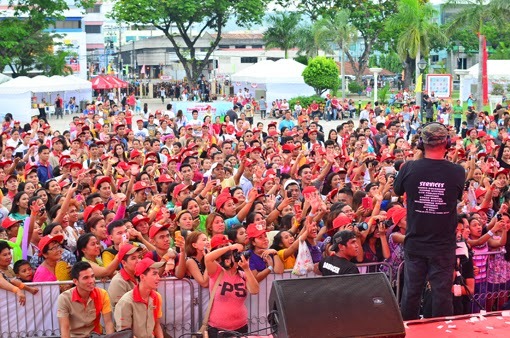 The Jollibee Family Bee Day event was highlighted by performances from topnotch celebrity guests, live bands, side attractions and overflowing Jollibee treats. Quirino Grandstand participants was entertained by Martin Nievera, Klarisse de Guzman and Callalily while those who trooped to the Nuvali football grounds got star struck with Marian Rivera, Erik Santos and Moonstar 88. Gerald Anderson cheered up the crowd with a song number. Yum endorser Julia Barretto, Shaina Magdayao, Rayver Cruz and 6 Cyclemind wowed audiences at the Bayanihan Park while Maja Salvador, Slater Young and Imago entertained Jollibee Family Bee Day picnic-goers at the Crocodile Park in Davao. Yael Yuzon of Spongecola performing before the huge Cebuano crowd. Kids had a grand time playing at the inflatable slide and basketball shootout, families also enjoyed posing by the giant picnic basket and special photo frame wall installations to capture the fun moments. Local stilt walkers and jugglers paraded around and dance performances from Jollibee and friends, Jollibee Kids Club members and leading dance crews kept the excitement up throughout the afternoon picnic. 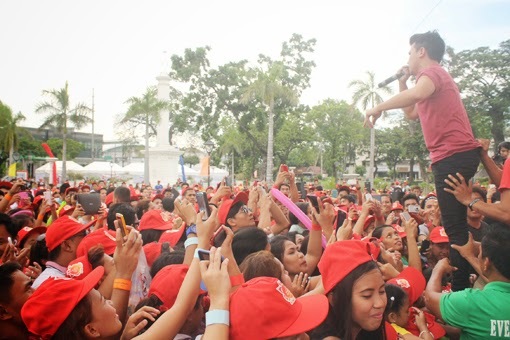 Jollibee PR Manager Dennis Reyes, Jollibee Regional Marketing Officer Leah Sausa, and Jollibee Regional Marketing Manager Nelson Judaya with the band Spongecola, headed by vocalist Yael Yuzon flocked at the giant picnic basket . The Jollibee Familly Bee Day grand picnic turn an ordinary summer afternoon into a fun-filled celebration with exciting entertainment from some of the country’s leading celebrities and bands, outdoor fun and games and great-tasting food, enabling thousands of families to celebrate the grandest picnic ever! 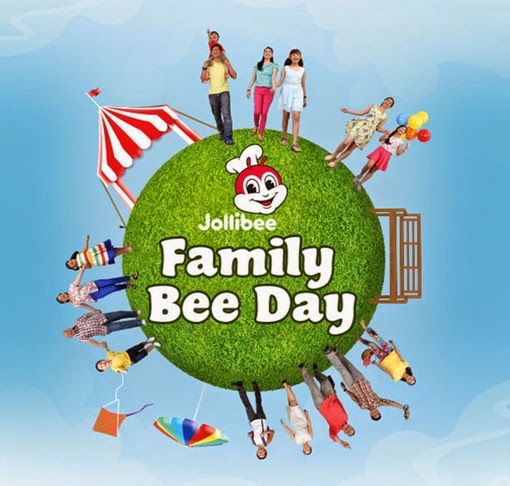 The Jollibee Familly Bee Day grand picnic official hashtag is #FamilyBeeDay. 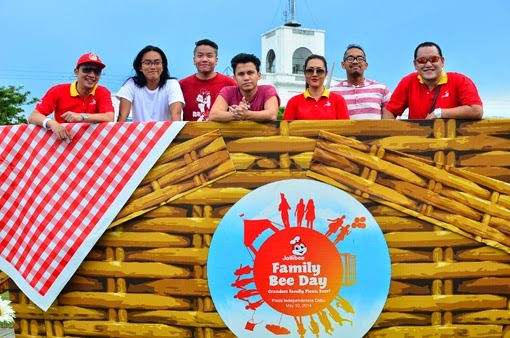 0 comments: on "Grandest Picnic at Jollibee Family Bee Day held at Plaza Independencia Cebu"